This project developed from general research into more ecological lifestyles and services. Perhaps people only need to be nudged to use such services. No one is happy to exchange comfort for a service that apparently gives no advantage. So why not create a system that allows people to use an existing service to greater sustainable effect? A service that uses not only functionality to attract the user, but also amusement. Laundrym is a networked laundrette service. Through the network people can communicate with the laundry itself and reserve machines using mobile phones. 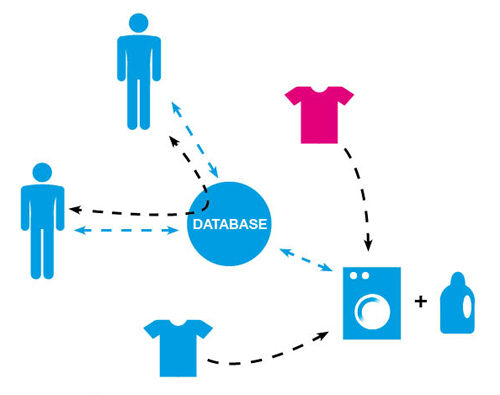 The network also allows other kinds of communication: users can communicate with each other to arrange to meet or tobe authorized to collect each other’s laundry, and the machine can read tags on clothes and suggest appropriate washing cycles. The project was developed between three disciplines: interaction design, service design and product design. It aims not to create an object but to make existing objects and services more efficient by focusing on users. The service is based on a database that manages all the data coming from users and machines and provides them with all the information they need. After an overall definition of the service, the thesis report focuses on the design of those components related to the users—the mobile phone software and physical interface—because these make the service useful and entertaining. The description of the mobile software shows how users can enter and use the service. It shows which information is needed, its hierarchy, and how it is organized graphically on a little screen. The programming language Mobile Processing was used to create the software for testing the project directly on the mobile phone. The physical interface was built by defining what information is needed and how its spatial and sequential presentation might make it understandable. The path to the final solution was not linear because design decisions were, at intervals, modified by interviews with potential users and by feedback from the Whirlpool Usability Center Europe. A testing prototype of the final solution was built using Processing and Wiring.